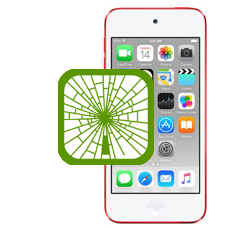 If you have damaged your iPod Touch 6th generation LCD screen and can see black ink spots or bleeding you may have also shattered the glass touch screen layer as well, then you will need the complete screen replaced. The replacement LCD and touch screen are original genuine Apple parts. * Our normal repair turnaround times are 3 - 10 working days. We always aim to complete repairs as fast as possible. This is an in-house Apple iPod Touch 6th Generation repair service, when ordering this service you are required to ship your iPod into our repair centre for works to be undertaken.